13 Apr It’s crowdfunding time!! Our clean-up kit is almost ready! Help us gathering the missing funds and get one for your next trip! We have finished the design of our first clean-up kit made from recycled materials! The kits are almost ready to be in your backpack for your next trip. We think it looks fantastic, don’t you? Why “almost ready” ? Because we miss the last CHF 5’000 to complete the production of our first 1’000 units. -UPDATE – We’re almost half way there! – Afterwards, we will be able to ensure the production, packing and shipping all over the world. You will receive a cleaning kit to take with you for your next trip. You can even get some nice perks in addition. 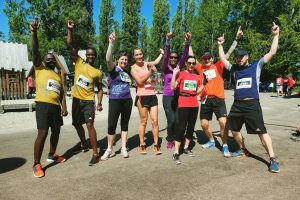 29 runners will run the 10 and 20 kms of Lausanne and Geneva, end of April, to support the campaign. You might know one of them. Show him/her your support for the race! 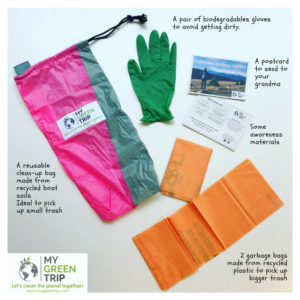 Don’t wait and click here to support our crowdfunding campaign and help us clean our planet!